On M.U.S.C.L.E. branding and packaging it is portrayed that Buffaloman (or Terri-Bull) is the central antagonist of the toy line. In the Kinnikuman story and cartoon it is Kinkotsuman that is the main rival to Kinnikuman. I find this interesting that Mattel chose Buffaloman instead. 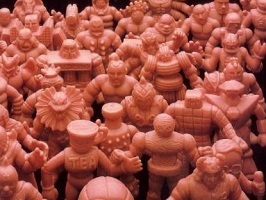 Maybe it’s the fact that Kinkotsuman is one of those really skinny M.U.S.C.L.E. figures. I generally can’t stand a lot of the skinny M.U.S.C.L.E. figures and this one is no exception. It doesn’t display well and it’s hard to stand a group of them up. Too bad the M.U.S.C.L.E. version wasn’t the sculpt they used for the 1991 Kinkeshi Series Kinkotsuman. Perhaps they didn’t select that figure because he holds a gun and Mattel did not want guns in their wrestling M.U.S.C.L.E. brand. So why do I have a collection of this figure? Well, the Japanese lines of the figure that are full color (Romando, Banpresto, and Kubrick) have a really nice color scheme. The figure also added a little more body fat compared to the M.U.S.C.L.E. figure. This makes the figure much more attractive on display. Plus, he is the main villain and I love the villain in every story. The other reason I need to have a few Kinkotsuman figures on my display shelves is that I am a massive fan of his sidekick Iwao (M.U.S.C.L.E. #23 to be covered in future MMMM) and so the two of them share spare on the same shelves – like a Sith and his apprentice. This entry was posted on Monday, February 10th, 2014 and is filed under UofM News. You can follow any responses to this entry through RSS 2.0. You can skip to the end and leave a response. Pinging is currently not allowed. 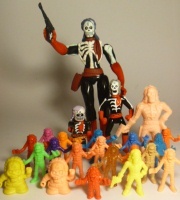 Skullduggery, as Ultimate Muscle rechristened him, becomes a side character in the original series. I still like The Skullduggery ans Rocky Slabb team, though. They were great comic relief, especially when Detective Thomas Gunn joined them to take them to prison. 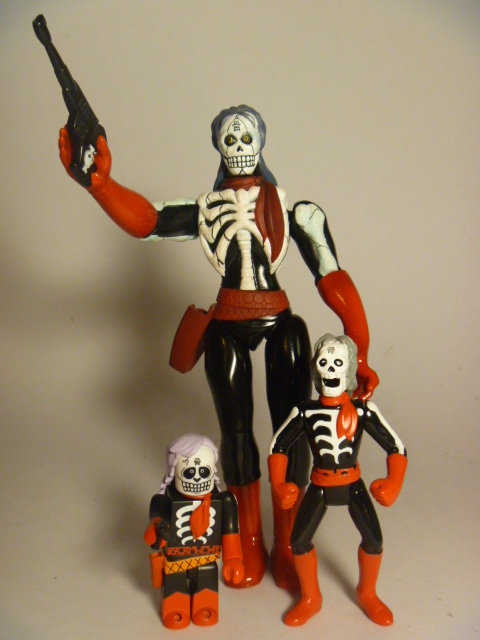 Bones & Tendon Man could probably be translated “Skin & Bones Man” if you wanted to keep the meaning. Muscleman vs. Skin-and-bones Man.